'No Ledge' To Stand On: 4 Ways to Balance Knowledge Management without Falling over the Edge! Knowledge management is experiencing a transition – and it is all about balance. The traditional knowledge infrastructure that pushed content from technical writers and legal approvers to frontline employees and customers is morphing into a collaborative, multi-directional platform that gives a voice to employees and customers. Here, we’ll outline the practices that are driving more effective and efficient knowledge management systems and what to expect next. While organizational leaders maintain final approval of the content, today’s employees and customer audiences demand to be involved in the knowledge curation process. Employees and customers are the end users of the content and want to rate, comment, like/dislike, and share the content as they see fit. Moreover, users trust users. It’s prevalent in all aspects of today’s business world. From TripAdvisor to Yelp to every app store on the market, end users are providing feedback and trusting each other’s feedback before that of the “industry experts.” Employees also require official content which they can share with customers, who in turn expect to receive responses directly from companies. To that effect, there is a need for social collaboration and knowledge sharing. But social collaboration is only the beginning. Intelligent knowledge platforms are more than technologies. They are organic ecosystems that empower personalized, real-time information to be presented when required. With telephony advancements introducing skill-based and precision queuing, knowledge solutions enable companies to route customers to the appropriate employee. The appropriate employee is based on factors such as demographic data, performance, proficiency, competency, certifications, and of course, availability. Customers are routed to the best employee to manage their inquiry and the employee simultaneously receives information that pertains to the caller. Employees have access to the customer’s self-service history (e.g., when the customer was on the web, social community, or other channels) and his or her IVR activity. The knowledge platform’s analytics and algorithms determine the “right” knowledge article to present to the employee, along with other articles that will assist the employee in assisting the customer. This proactive approach to knowledge allows the employee to focus on the customer instead of searching for documentation, thereby improving the customer experience. The employee rates the articles accordingly, à la Uber, for relevance and quality, thus training the knowledge base to be smarter. The training of the knowledge base is where we transition to bots and artificial intelligence. Bots and artificial intelligence are flashy, trending terms, but there is an underlying value to the technology. Savvy organizations are positioning themselves to leverage bots and artificial intelligence by training the bots. Feedback from employees and customers, as well as ratings, comments, and other information can be used to educate the knowledge base bot. The more employees and customers provide feedback, the smarter the bot becomes and the better it is at recommending the right article to the appropriate employee based on the specific customer. The same concept applies for customer-only use. When interacting with a knowledge base, customers receive bot-intelligent responses that are personalized to them based on the account type, status, location, and other customer information. All customers are not equal and should not be treated that way. When premium customers request information they receive the answer specific to them, versus a standard customer who may not get all the perks as the premium customer. In today’s mobile world, geolocation-enablement means companies can provide location-based information to enhance the self-help experience. To make this effective, it is imperative that employees and customers are incented to provide feedback, ratings, and commentary. This is where gamification comes in. For instance, the travel and hospitality industries have long used game-based mechanics to drive real world behavioral changes. This is the use of points, badges, and statuses to encourage users to interact with the company. Specific to knowledge management, gamification practices are employed to motivate and reward employees and customers for providing feedback. The same practice can fuel bot training. Providing points, badges, and statuses to users, though, is a blend of science and art. While it’s essential to engage users to “play the game,” it cannot feel like they are being gamed and at the same time efficient monitoring must be present to ensure users aren’t successful in gaming the solution. If any of the above take place, the solution breaks. Users lose trust in the practice and without that trust, the solution breaks. It’s important for the company or its partner to manage the rules, monitor the activities, and adjust the game based on user activity. Rewards and acknowledgement have an immensely powerful effect on morale, engagement, and efficiency, especially when the data from the engagement is being used to enhance the overall quality of the infrastructure and knowledge content. Which leads to the importance of content. Knowledge content has been historically written and approved by technical writers, subject matter experts, and legal advisors. The result has been long, complicated, and very precise documents that protect the company but rarely help the end user. Content must be easily consumable. A best practice includes working with the appropriate staff to ensure the content is accurate, yet easily consumable. Images and multimedia content complement the concise, easy-to-follow information that uses common language, while still being technically accurate. Information should be presented in templated HTML article pages (versus PDFs or Office attachments which are heavy and take time to open). This light, native design ensures that through advanced permissions, multiple users have access to the same article, yet only see the information prevalent to them based on their profile. This becomes extremely important as it controls the number of articles needed, as permissions are used to only present the appropriate information to the appropriate user. There are other benefits as well. The ability to compartmentalize content allows self-help systems such as IVRs and websites to access the content from the knowledge articles faster and process it for other channels. This includes performing text-to-speech conversions (for IVRs) or the direct text or multimedia content (for online websites, forums, and social communities). Instead of having multiple knowledge sources for various channels, companies now have one single knowledge repository with a single source of truth. Regardless of channel, from speaking with an employee to IVR self-help, to chatbots or online inquiries, all information is sourced from the single knowledge source and appropriately presented to each customer based on each interaction. In other words, customers always get the right answer, which is consistent across all channels. While it may be difficult to incorporate all of these practices at once, identify your company’s objectives and build from there. The benefits of creating a frictionless experience for your employees and customers should be a no-brainer—it’s just a matter of taking the first step. Learn more about how to create effective and efficient knowledge management systems at our complimentary webinar. Like this post? 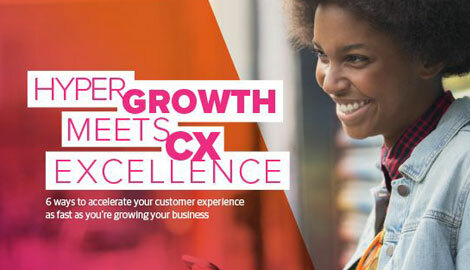 Subscribe to our customer experience blog.